HP has been on a tear for more business users, and its latest move is daring, to say the least. The company has announced the Pro x2 410, a new version of its x2 11.6-inch hybrid laptop for casual users, but now with a business bent. The idea here is that the Pro x2 is an 0.88-inch thin laptop when you're in the office or need a full computer experience en route, but can be a 0.09-inch thin tablet when you don't. Hoping to equip this detachable notebook for the task, HP packed the Pro x2 with Windows 8.1 Pro and up to an Intel Core i7 (Haswell) chip. Tack on 4GB of RAM and up to 256GB storage behind a 1366 x 768 LED touch panel, and this hybrid looks like it will be ready for the job, at least on paper. All of this rests in a sleek, all-black plastic chassis, but sleek or not, that size doesn't leave much room for connectivity. The base on the Pro x2 offers one two USB ports (one 3.0), HDMI out and a headphone/mic jack, while the tablet houses a mere microSD slot and headphone/mic jack. HP hopes you'll take advantage of wireless connectivity options, like Bluetooth 4.0 standard and Intel WiDi to fill the gaps. But hey, at least the notebook has matching 2MP cameras on the front and rear. 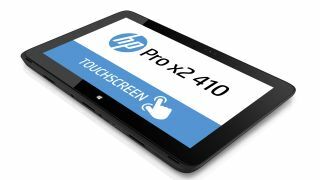 The HP Pro x2 410 is available now in the US with "a starting price at or under" (HP's words, not ours) $899 (around £547, AU$1,001) – ouch. If you're not impressed by the bells and whistles of on-the-job hybrid laptops, then HP has the new 350 G1 just for you. This 15-inch business notebook offers dual-core Intel Core processors (Haswell) up to i7 as well as Pentium and Celeron chips to start and a 1366 x 768 LED screen across all configurations. We did say that this was a budget laptop, right? Moving on, users can score up to 16GB of RAM and a 5,400 rpm hard drive as spacious as 1TB (or a 500GB, 7,200 rpm drive). Finally, you can also upgrade to an AMD Radeon HD 8670M for discrete graphics. These components can run the user's choice of Windows 8.1 Pro, Windows 7 Professional or Ubuntu. On the I/O front, the 350 G1 has size on its side, with three USB ports (two 3.0), HDMI, VGA, RJ-45 Ethernet, a 3-in-1 card reader and a headphone/mic jack. As for wireless, 802.11 b/g/n comes standard, but Bluetooth 4.0 is an option. Finally, if you're company is a bit … behind the times, a built-in optical drive is an option. But again, all of these upgrades would be missing the point. The 350 G1 is a budget machine through and through. The only marquee features here are a spill-resistant keyboard and HP's CoolSense, which adjusts temperature based on use. The HP 350 G1 is available now in the US for a light $399 (about £242, AU$444).